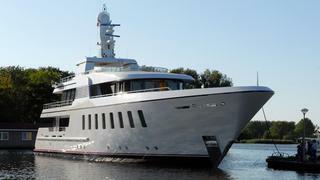 Yesterday saw the launch of the fifth F45 superyacht from Feadship's Royal Van Lent Yard, the 44.65m Helix. Designed by De Voogt Naval Architects and Sinot Yacht Design, Helix is an exceptionally sophisticated superyacht in terms of her layout, finish and technology. Accommodation, all on the main deck, is for 10 guests in a master stateroom and four further suites. Twin 1055hp MTU engines give Helix a maximum speed of 14.5 knots and a transatlantic range. Following her sea trials Helix will cruise to the Mediterranean ready to make her public debut at the forthcoming Monaco Yacht Show, from September 21st to 24th.